* It should be obvious to sentient human beings that the guy who couldn’t spell “potato” is the last person to be judging competence. But as Steve Benen points out, that is exactly what Dan Quayle did. * Lately I’ve been thinking that I want to write about the ongoing Republican obstruction of President Obama’s Supreme Court nominee Merrick Garland. Dahlia Lithwick captured exactly why that is a challenge. Because there is virtually nothing happening each day, there is virtually nothing to write about each day. And because we don’t write about it each day, voters continue not to know that it is going on each day. And since so many Americans don’t know about what isn’t happening to the empty seat at the Supreme Court each day, that all adds inexorably to the vague general impression that they must not care about it. And since they don’t seem to care about it, it hardly makes sense to write about it. Right? To all my friends on FB, just a short note to you on our pus headed “president” !!!! This character who I refer to as zero (0) should have been taken out by our military and shot as an enemy agent in his first term !!!!! Instead he still remains in office doing every thing he can to gut the America we all know and love !!!!! Apparently Mr. Senecal is about to be on the receiving end of a visit from the Secret Service. The Secret Service said Thursday it will investigate comments made by Donald Trump’s longtime butler calling for President Obama to be killed. * Hillary Clinton published an op-ed titled Restoring Faith in Democracy that basically outlines her proposals on protecting voting rights and enhancing participation. But she ends with something that should get more attention. But enfranchisement isn’t solely a matter of individual rights. In the case of our nation’s capital, we have an entire populace that is routinely denied a voice in its own democracy. Washington, D.C., is home to nearly 700,000 Americans – more than the entire population of several states. Washingtonians serve in the military, serve on juries and pay taxes just like everyone else. And yet they don’t even have a vote in Congress. Hard as it is to believe, America is the only democracy on the planet that treats the residents of capital this way. * The Obama administration just keeps on keeping on. The Obama administration on Thursday announced a set of much-anticipated — and first ever — steps to regulate oil and gas industry emissions of methane, a powerful greenhouse gas second only to carbon dioxide in its role in the climate debate. The Environmental Protection Agency unveiled a new rule that will target emissions from new or modified oil and gas wells — and prevent 11 million metric tons of carbon dioxide equivalent emissions by the year 2025, the agency said. 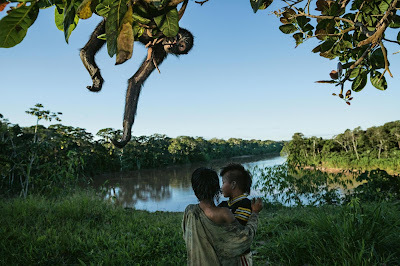 * Finally, stories like this one in National Geographic titled: This Park in Peru Is Nature ‘in Its Full Glory’ – With Hunters remind me that, even with the internet, the part of the world I experience is actually pretty small.